mommy's reviews: FREE sample of Honey Nut Cheerios! What child does not LOVE Honey Nut Cheerios??? Mine do!! 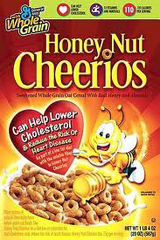 Here is an opportunity to get a free sample of Honey Nut Cheerios, plus a coupon...shipped right to your mailbox! Click HERE for this freebie.